From humble beginnings at Najjanankumbi, Uganda’s oldest band, Afrigo band, makes 38 years. Today, only band leader Moses Matovu survives of the original eight members. But that hasn’t stopped the band from maintaining the highest level of live performance that has seen them survive several music storms. In this first of a two-part series, Hassan Badru Zziwa recollects the band’s treasured memories as well as who-is-who of the original setup. Jeff Sewava: The founding band leader, Sewava, led the split from Cranes band months before the formation of Afrigo. He was a saxophonist and a vocalist but left the band towards the end of 1977 and relocated to Germany, where he lives to date. He is best remembered for composing Betty, a popular song then. Moses Matovu: He came up with the band’s name ‘Afrigo,’ which is a short form of their self-motivating slogan, ‘Africa-Go in music.’ Matovu took over band leadership from Sewava and is the remaining member of the pioneers and one of three band directors alongside James Wasula and Sam ‘Kapeera’ Tamale. Apart from being the band’s lead vocalist right from its inception, Matovu also plays the flute but is best known as the unrivaled saxophone maestro. Also an accomplished composer, Matovu is the brains behind some of the band’s biggest hits such as Nantongo, Sirina Anantwala, Afrigo Batuuse 1, Speed, Bagikwongere, Mundeke, Tondeka Awaka, Ngenze N’ono and Sirina Reverse, among others. Charles Sekyanzi (RIP): A trumpeter, Sekyanzi’s was one of the most recognizable figures in the band due to his sheer vocal refinement. His calm style endeared him to fans and rubbed off well Matovu’s precise singing on several hits. He composed songs like Musa, Rose Guma and Onnemye, but his Enneeyisa stands out to this day as one of the band’s greatest hits. Sekyanzi died in March 2009. Paddy Nsubuga (RIP): A vocalist, he also played the rhythm guitar. Nsubuga stepped out of the shadows in 1985 with his composition Express, a hit that celebrated Express FC’s Uganda Cup triumph that year. Nsubuga passed away in the late 1980s. Anthony Kyeyune: Originally the band technician, Kyeyune learnt on the job to become a trumpeter. He left in the 1980s and became a businessman. Fred Luyombya (RIP): Luyombya was the band’s bass guitarist and lent his vocals on several hits. His biggest composition was the hit Christine, in the late 70s. He left the band in the 1980s and passed away in the late 80s. Paul Serumaga (RIP): The multi-talented Serumaga made his name as a lead guitarist as well as a vocalist. But for all his attributes, his Oswadde Nnyo remains one of the most popular hits the band has ever made. He passed away in 1989. As the band grew stronger and the fan base wider, it attracted several budding talents and a few established names. Billy Mutebi (RIP): He joined in the late 1970s and became lead guitarist. Also a vocalist, Mutebi moved to Sweden where he teamed up with several Ugandan musicians such as Philly Lutaaya and Sammy Kasule. Among his popular compositions while in Afrigo are Olumbe Lw’obwavu, Ebizibu, Zalwango and Ekitiibwa Kyo. He returned to the country in the late 1980s but died in 1989. Frank Mbalire: He joined in the late 70s as a rhythm guitarist but later moved to the Thames band, from where he composed Bamuleete and the popular Sirikusuula. He relocated to Sweden before returning to Afrigo band. However, in 2009, Mbalire left Afrigo to form Misty Jazz band, which also has Moses Matovu and had made Kampala Casino their home. Godfrey Mwambala (RIP): He joined the group in the late 1970s as a keyboard player but because the band had no keyboard, he became the band’s drum player following the departure of Gerald Naddibanga to Sweden. Mwambala also became one of the group’s composers and some of his hits include Jim, Mp’eddembe, Julie and Obutonde Bwensi, among others. He died in 1996. Gerald Naddibanga: Arguably the best drummer to come out of Uganda, Naddibanga joined in the late 1970s. He also had his moments on the microphone, as well as doing some dancing, but he moved to Sweden in early 1980s, where he lives to date. Deo Mukungu: He joined in 1987 as a guitarist but made his major breakthrough by composing the smash hit Afrigo Batuuse II in 1989. Mukungu relocated to the UK in the mid-90s. Fred Kigozi (RIP): He joined in the late 1980s as a vocalist and some of his classic compositions include Semuwemba and Prossie. He passed away in the late 90s. 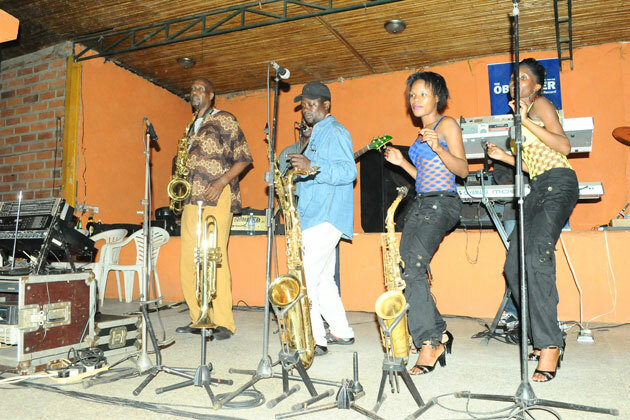 Mansur Bulegeya (RIP): The saxophonist joined in the 1980s but passed away in 2007. Tony Senkebejje: Together with his wife Racheal, Tony joined in late 1980s as a bass guitarist and vocalist. His popular compositions include Dora, Alivawa, Twali Twagalana and Jukira. The couple left in the 1990s to form Simba Sounds, a resident band at Kampala Serena hotel. Tony Sengo (RIP): Versatile Sengo could virtually play any instrument, but specialised in the keyboard. Sengo came on board in the 1980s and the multi-talented artiste composed several songs like Emmere Esiridde, Kangende Nga Munonya, Ki Kyetunonya and Bw’osika Ekitajja. He left in the 1990s to found The Big Five band, before forming his own Badindazi band. He died in 1999. Albert Amigo ‘Wawawa’ (RIP): Amigo joined Afrigo in 1994 as a lead guitarist but also had a couple of compositions like Safari, Yote Bule, Shamusha and Ekikere Kiri ku Mbaata. He left the group in the 1990s to start his Waka Waka band. Dede Majoro (RIP): One of the celebrated lead guitarists who joined Afrigo in the 1980s but left in the 1990s to join Simbangoma band and later Hope Mukasa’s Mixed Talent band, before passing away. Justin Matu: He joined the group in 2002 as a lead guitarist from Sarah Birungi’s IRO Stars. He left the band in 2010 and relocated to the USA. Meddie Mbaziira: He joined Afrigo in the late 1980s, playing trumpet and a vocalist at the same time. He composed Sirina Musango but later moved to Summit band. Rashid Musoke: Joined the group in the late 1980s as a drum player, but passed away in May 1993. Others who went through Afrigo band are: Julius Jjuuko (keyboard); Godfrey Khadume (keyboard and trumpet), Tony Kalanzi (vocalist), Godfrey Ngoobi (bass guitar), Stanley Ntwatwa (drums), Grace Lukomwa (bass guitar), Margaret Kawalya (vocalist), Abdul Kintu (vocalist), Harriet Mpagi (vocalist), Juliet Kiwanuka (vocalist), Afua Luzinda (vocalist), Sarah Namulondo (dancer), Sarah Ndagire (singer/dancer), Sandra Namiti (dancer), Remi Wasajja (dancer) and Eva Nalumansi (dancer).